I watched a few YouTube videos yesterday. These ones were really angry. The videos were of a man who constantly bashed other translations of the bible. And claimed that the KJV is God’s only inspired word for English speakers. Not because he was so angry and up-in-arms about it. but at the same time, opposite. I used to hate people who used the KJV NKJV or any ‘old’ translation. God speaks thru His word. Whether that is KJV NKJV NIV NRSV AMP or ESV. He speaks. Thru His word. It is up to us to read it, treasure it and abide in it. So – don’t worry about having the ‘most accurate’ or ‘most readable’ version. Get what you feel most comfortable reading…and listen. Previous Post Previous post: On Suffering. I mostly agree with you, although I’d say we should also do our homework and understand the pros and cons of each translation as well! Humility comes when we realize that our “favourite” is not necessarily the “best” for everyone. ie. I have a friend who wanted a new Bible that was great for study (not just casual reading) so since he doesn’t have a basic understanding of greek or hebrew, I recommended he avoid NASB and check into the ESV. I know someone who love poetry. Go KJV. Just remember some of the slants it may take. I know people who adore the NIV. I warn them about how it over-spiritualizes some verses. All in all, translations end up showing multiple light of the original text that we can’t read unless we know the original languages. Does it make it inaccurate? Not in the slightest. If anything, it helps us see things in ways we never would have considered. I think multiple translations are a blessing so long as they’re credible! Hence why as I pastor I use the following for study: NIV, TNIV, NLT, NASB, KJV, The Message, ESV. I avoid BLTs though… I hate tomato. Well of course there are more ‘current’ and ‘accurate’ to the original translations. But that doesn’t mean the Spirit of God can’t still speak thru the KJV or any other translation. 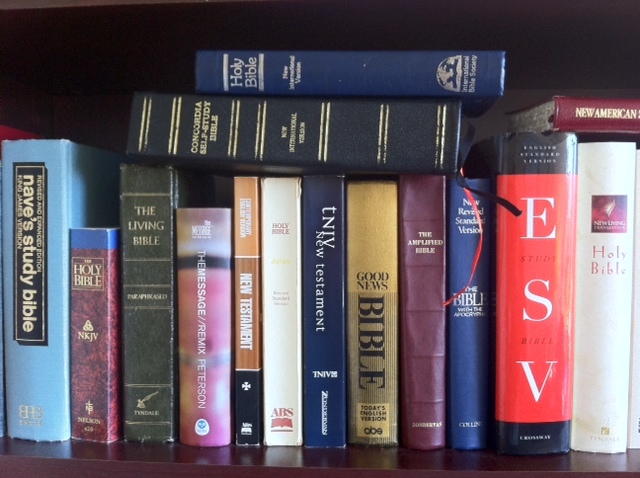 I use ESV for deep studies along with my NASB. But for casual reading I use my NIV. It is okay to have a preference, it is NOT okay to think that other people aren’t actually reading the Word of God when they are just using a different translation. ROFLOL!!!!! I think that’s the best thing I’ve ever heard on this topic! What are your thoughts on The Message? I know it’s still a version of the Bible, but isn’t a paraphrase different than a translation? Thoughts? It is a paraphrase. And the writer of that translation even says to use another translation beside it. The Message is a great one to use for clarification or simplification of ideas/themes/texts that don’t quite make sense to our minds. I just came across this quote from C.S. Lewis in one of his letters where he said, the less the Bible is read the more it is translated. I was the opposite of you, though, I was up in arms against anything new…not so much now – just read the thing!